After a lifetime of saving, investors may be in for a shock when they come to retire, the results of a global study suggest. Investors close to retirement (aged 55 and over) expect they will need income equivalent to 73.9% of their current salary to afford to live comfortably in retirement. But those already retired say the average amount they actually receive is far less, at 60.8% of their final salary. On average, 85% said this was sufficient but 58% also said they could use a little more money. These were among the key findings of the Schroders Global Investor Study (GIS) 2018, which surveyed more than 22,000 investors across 30 countries. 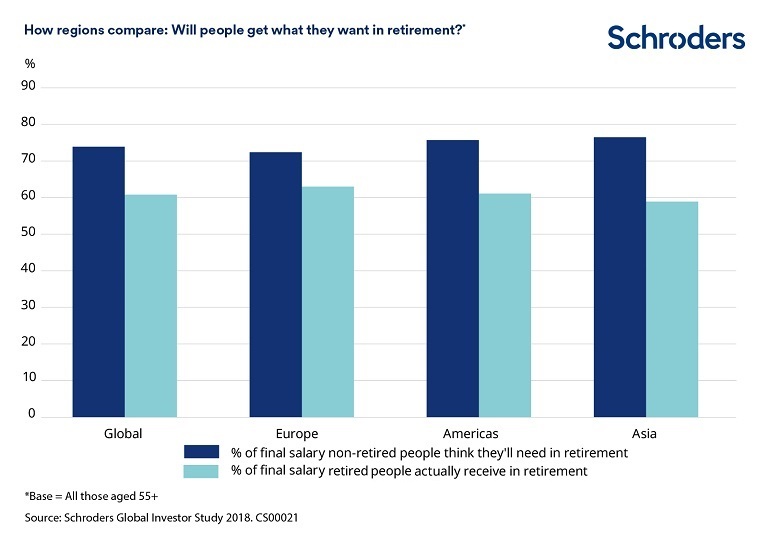 Expectations for the income needed for retirement varied geographically with non-retired investors in some countries – Poland and Indonesia – believing that they will need more than 100% of their salary for a comfortable retirement. Those already retired typically receive far less, as shown in the table below. Across regions, investors in Asia and the Americas expect to need the highest replacement rate, believing they will need three-quarters of their current salary. How much are savers putting away for retirement? The amount of income investors can expect in retirement is dependent on a range of factors but one of the most important is the rate at which people put money away. The average investor saves 12.2% of their current salary for retirement. However, that is less than the 14.4% they think should be saving to reach their target. The rate varies regionally. In Europe, non-retired Belgians save the least (9.2%) as a percentage of their current salary to fund retirement and the Danes say they save the most (12.5%). In Asia, people in Hong Kong save just 10.9% of their current salary for retirement compared with 15.3% for Singaporeans. In the Americas, Canadians save the least (11.9%), while the US saves the most (15.4%). The gap between what people are saving and what they think they should be saving was widest in developing economies. For example, people in Chile are currently saving 12.8% of their current salary but think they should be saving 19.2%, a difference of 6.4%. The only people currently saving more than they thought needed were the Danish, 12.5% vs 12.3%. Calculating the right amount to save for retirement is a challenge for investors. The final savings total and the income it will provide, are affected by a range of factors. It is not just about how much you save but it is determined by the returns you achieve and the amount of time you’re invested. You also need to consider how much you want your pension income to be compared to your working income. This largely comes down to the lifestyle you want in retirement and how much of this your country’s government pension will provide. Our study shows that globally investors are aiming for a 74% replacement rate. This is relatively high against most financial planning modelling. For example, future net replacement rates (including government provision) average 63% among OECD countries, according to OECD and G20 indicators. The model developed by Schroders, below, shows the level of investment returns needed to achieve replacement rates of 66% and 50%, assuming this is being funded by private savings alone. It is based on the rates of retirement income available today from a guaranteed annuity. The scenarios will vary if you choose instead to keep the money invested or take it as a cash lump sum. To explain one scenario, if someone saves 15% of their salary from the age of 25 and wants to retire at 65, they would require an average annual return of 2.5% above inflation (the middle column) to achieve a retirement income worth 66% of their working income. If they contributed 10% of their income, however, they would need a return of 4.2% above inflation. It’s worth noting that if you only save 5% of your salary from age 25, you may need returns that exceed inflation by 7% to create a retirement account large enough to replace 66% of your salary, based on today’s rates of annuity income. To put that into perspective, the Credit Suisse Investment Returns Yearbook shows that over the last 118 years, global equities have delivered annual real returns (taking inflation into account) of 5.2%. While it is difficult to forecast future returns accurately, the Schroders Economics Group expects that, given the current environment and future growth prospects, lower average returns above inflation of 3.8% a year are likely from global stockmarkets over the next 30 years. Newer Post How much will politics impact my investments?